Gustavo Herrera Yepez won 3rd place in our 2018 Photography Competition, category ‘Series’. I’m a visual artist born in Chicago to parents born in Guanajuato. I served as teaching artist for the National Museum of Mexican Art, photo documenting projects and programming for an extended period. I continue to independently photo document in Mexico, USA and across the world. The presented works convey the most unique of my “Día de Muertos” experiences, the day of the dead market in Tlacolula where Zapotec locals from very small towns flock to a centralized market for all their celebratory needs. Included also, the Purépecha community along lake Patzcuaro, vibrant and thriving communities across the state of Michoacán, visual spectacle so intimate one can only feel the invitation. 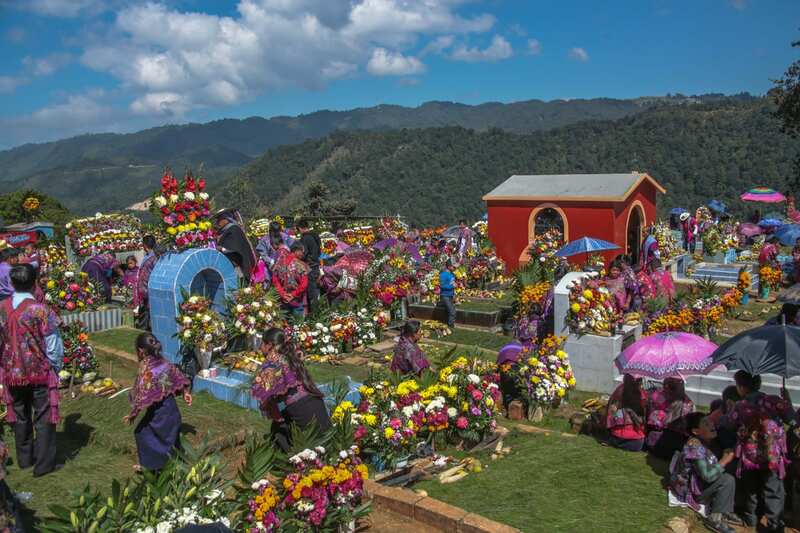 In the highlands of Chiapas, descendants of the Mayans, the Tzotzil communities walk up to a mountainous cemetery bright and early in the morning to celebrate their ancient ritual. 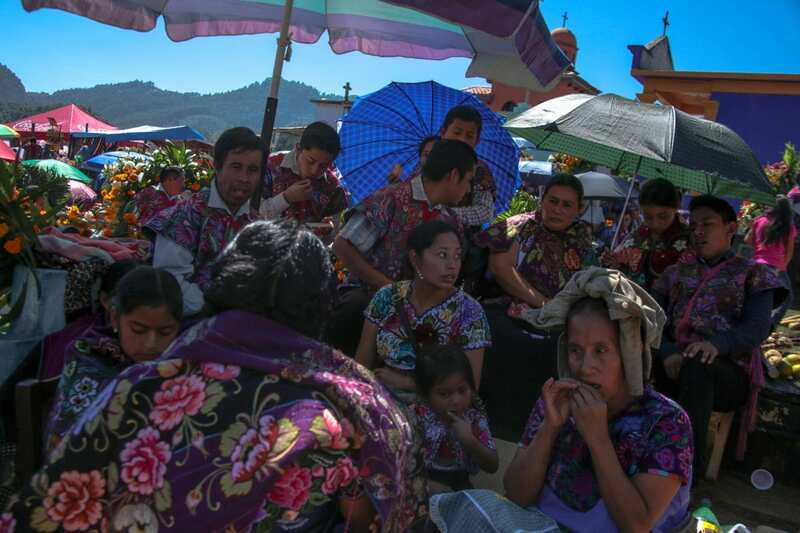 A few days before Dia De los Muertos celebrations begin, waves of surrounding Zapotec indigenous communities descend from the surrounding mountains to Tlacolula, a small town located in Oaxaca, Mexico. 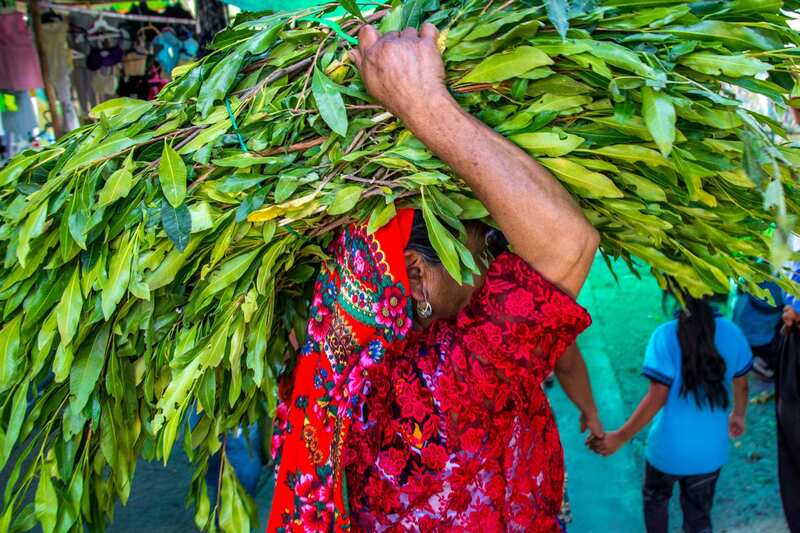 The town is known for its Mercado de Muertos, where the diverse group of Zapotec communities gather to prepare for all of their celebration needs. Here, a Zapotec woman, dressed in a traditional tehuana, carries a bushel of leaves for her ofrenda. The Perez family, direct descendants of the Tzotzil Maya, sit around the tomb of their mother as they wait for the higher priest to arrive and perform a prayer. During Dia de los Muertos, all members of the community gather at the local cemetery atop the mountains and wait as the priest prays to each individual tomb in the Tzotzil language. Once the priest has visited all the tombs, they all descend together back to town. 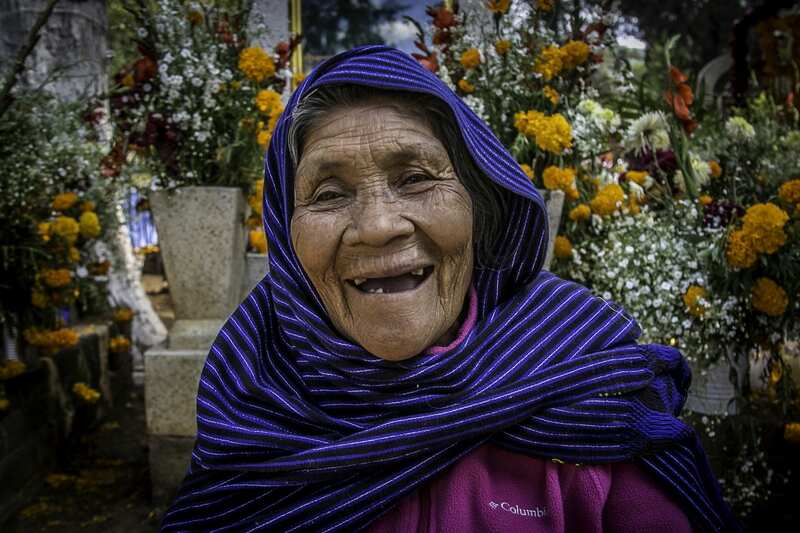 Zinancantan is home to the mountainous Tzotzil Mayan descendents. This indigenous community is known for their handmade embroidered textiles, which all carry a purple hue and intricate flower design. These elaborate textiles are worn by men, women and children during their intimate and secluded Dia De los Muertos celebration. 3RD PLACE SERIES- Gustavo Herera Yepez. 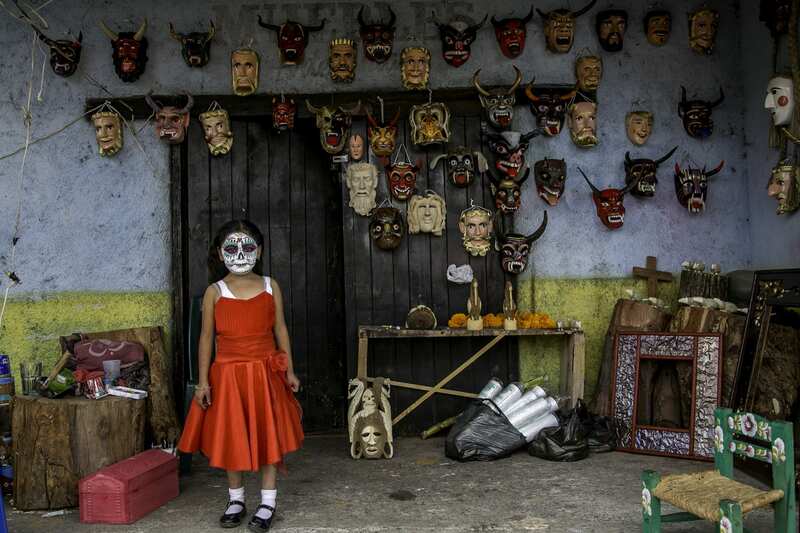 A Purepecha girl prepares for the nights festivities in Tocuaro, a region in Michoacan, Mexico known for its intricate wood-carved masks. These masks, often representing people or animals, are used to ward off evil spirits or welcome friendly souls. The Purepecha are an indigenous group centered in the northwest region of Michoacan who continue using ancient traditions and incorporate them in their celebrations of Dia de los Muertos. The pre-Columbian traditions of Dia De los Muertos throughout Mexico honor and celebrate their ancestry. Today, the traditions still vary greatly from town to town. 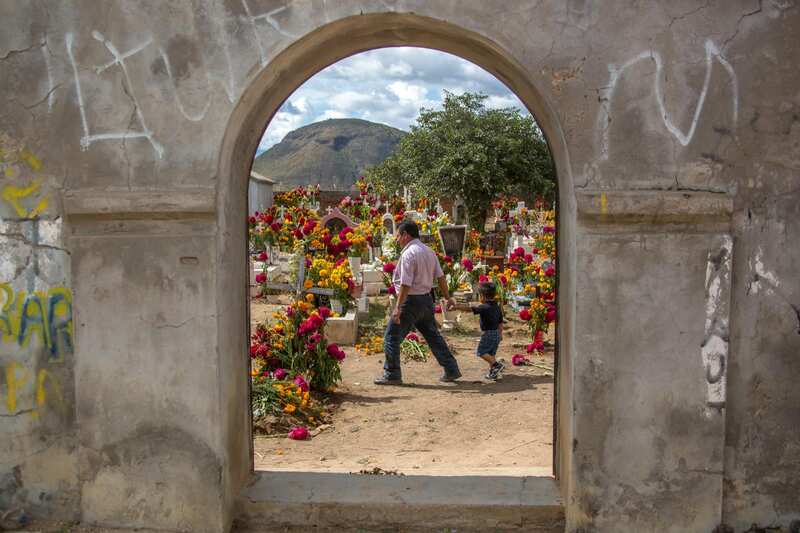 In San Martin Tilcajete, Oaxaca, the Zapotec community wakes up at dawn on October 31 to gather bouquets of fresh cempasuchiles and cresta de gallo—two iconic flowers used in the celebration to decorate the graves of their loved ones. It is believed that these native flowers help guide the souls of the deceased.